In the Dymo Label Maker range there are all different types and sizes of printers that print labels for all different purposes. Ultimately though, the labels themselves are the determinant of which machine you'll need for which purpose. For instance, there's a whole bunch of Dymo Label makers that will print a barcode label for a shelf in a warehouse. But, if you require say a Yellow label that is resistant to humidity and can handle exposure to sunlight, that certainly narrows down the label choices, and hence which of the various Dymo label makers that will suit your needs. As a rough overview, if you are looking to print labels for Addressing/Shipping or for purpose in/around the office where labels won't get much exposure to direct sunlight, the Dymo LabelWriter machines are right for you. If you are looking for a cost-effective way to print labels for the home/office, and don't mind being limited to just one label width (1/2"), the Dymo LetraTag is your perfect match. If you are looking for durable, varying widtch (1/4" thru 1") and different colors for use in the office/workplace, the Dymo LabelManager range is your obvious choice. Finally, if you require 'industrial-strength' labels, available in varying sizes, colors and materials, the Rhino or newer Dymo XTL industrial range will satisfy your needs. 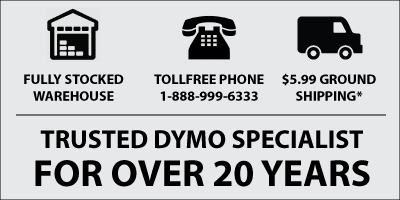 See the entire range of Dymo Label Maker machines here.